For some reason, I keep noticing eggs recently, even though it is not yet Easter. There was "the case of the mismatched eggs" at a Japanese eatery, and at a wedding I went to recently, I was treated to a custardy-soft 62 degree sous vide egg. I have also been running around the city, looking for the giant eggs in The Big Egg Hunt. So it makes sense that I should do something to do with eggs this month. Golden egg with a bowl of ramen. Actually, I had the idea of making my own Chinese salted eggs several months ago, which is why I can write about them now. Rather than using a fancier recipe with star anise, Sichuan peppers and Shaoxing wine, I found one that corresponded to what my parents told me they did: simply make a saturated salt water solution by adding salt to the water until it won't dissolve any more, put your raw eggs in, and leave them to soak for a month. 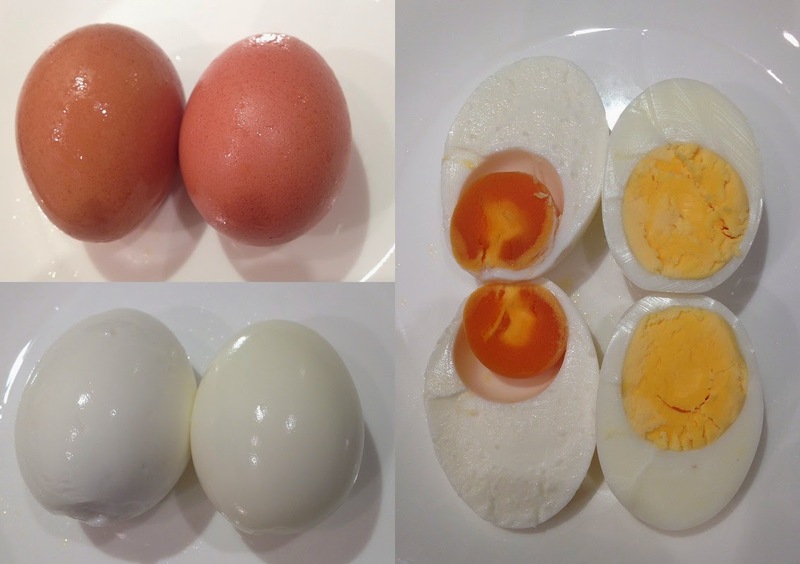 Boiled salted egg (left) and normal egg (right): not much difference on the outside, but the colour of the yolk and the texture of the white gives the game away. Sounds easy, except that I put the raw salted eggs in the fridge after soaking, and promptly forgot about them... until now. I can't tell you if it was due to the time delay, or something else I did wrong, but what I made did not look anything like the beautiful creation below. When I cracked them open (admittedly months after they were ready), there was an undefined lump of golden orange, but mostly, the yolk had become combined with the white, turning everything into a thick orangey mess (not pictured to spare your sensibilities). Beautiful salted egg (left) and normal egg (right), both raw. Fortunately, my parents had also made salted eggs, and they turned out perfect, so I could carry on and make the things I wanted to try. I am also reminded of the time when we went on holiday, and our house-sitter threw out an entire batch of salted eggs (again gifted from my parents), no doubt after receiving a shock from seeing a solid yolk rather than the usual consistency. One of the greatest recent dim sum inventions is the lau sar bao (流沙包), literally "flowing sand bun". Unlike the standard custard bun, this variation is generally made with salted egg yolks, and has a more liquid filling that flows out when hot (or in some cases, explodes in your mouth). I basically followed the recipe from Bake for Happy Kids, while taking a few liberties such as just using milk instead of milk powder and coconut milk, due to what I had in the kitchen. As it was not specified how the salted egg yolks were to be cooked, I took (what I thought was) the easy path, and simply microwaved them. As you might have guessed, this was not the correct technique, as the yolks burst and splattered everywhere. For some reason, I didn't think this would happen because the raw yolks looked so solid. Salted egg yolk: raw, microwaved, and cooked and broken up. Because I had a very liquid filling (perhaps I should have replaced the missing milk powder with something else), some of my buns started leaking even before I began steaming them. They also didn't look very pretty, because the water droplets from the steam made little pockmarks on the surface of the buns. My molten custard buns didn't have the right texture, with the bread too chewy (even though I deliberately purchased low gluten flour) and the filling too runny when hot, but the flavours were good. Filling too liquid when hot. The custard was a better texture once cooled to room temperature. I may need practice, but I am definitely keen to try this again! There are plenty of recipes for using salted egg yolks, but not so many for using up the whites. I was tempted to chuck the leftover whites into some kind of egg drop soup, but as we had old rice in the fridge, we made fried rice with it instead. We mixed the salted egg whites with a bit of fresh egg in case everything was too salty, but we actually ended up adding some salt back in. Not that different in taste from standard fried rice, but using whites gives it a paler colour. Fried rice with salted egg white. Literally "steamed three emperor egg", this version of Chinese steamed eggs makes use of three different kinds of eggs: fresh eggs, salted eggs, and century eggs. Not only do the colours look amazing, but it tastes great too, with the fresh eggs mellowing out the other flavours. Three colour eggs before steaming. I thought I was clever for substituting some fresh eggs with salted egg white, but I forgot to add water to the mixture, so my custard was too firm. Still, we enjoyed this dish. It was a bit too salty, but was great with rice. Three colour eggs after steaming. Many Chinese families will eat slices of cooked salted egg with congee for breakfast, but if you wanted to cook with them, here are some other ideas. These tend not so much to be dishes in themselves, but are modifications of recipes to use up the egg whites. This post is part of Our Growing Edge, a monthly blogging event aimed at inspiring us to try new things. This month, it is hosted by Medha from Mimi’s Mommy blog. Thanks! Looking forward to reading your round-up. I didn't think that making salt eggs would be that easy - I think I'll have to give it a go because I absolutely love salt egg with my congee. I love the three coloured eggs, looks so amazing! You can reuse your salt water solution, which makes the eggs even more cost effective. I think they taste better than store-bought ones too - the pre-cooked ones in particular are disgusting! Making them yourself just requires a bit of patience, and not forgetting about them as I did!